1. The mother has exclusive parental authority over her illegitimate child (Art. 176 of the Family Code). For example, a DSWD travel clearance is not required for an illegitimate child traveling abroad with the mother. 2. The biological father has visitorial right over his illegitimate children in view of the constitutionally protected inherent and natural right of parents over their children (Supreme Court ruling in Silva v. Court of Appeals, 1997). This right is personal to the father; no other person, like grandparents, can exercise this right for him. Silva (the father) may have won with the Supreme Court’s upholding of his visitation rights, but this favorable decision did not prevent Suzanne (the mother), in the exercise of her parental authority, from immigrating to Holland with her two children. 3. The right to visitation and the duty to pay child support are distinct and separate. 4. If the mother and the father of the illegitimate child can agree on the terms and conditions of the visitation, then there will be no problem. In case of disagreement however, the father must file a petition asking the court to settle the terms and conditions. Please read below the clarifications of the Supreme Court ruling on visitation rights like parental authority, travel clearance for illegitimate children, mother's written consent, and right to visitation and the duty to pay child support are distinct and separate. You need to read the facts of the Silva case below in order to appreciate better my discussion of these clarifications and related issues. 1. Visitation rights and parental authority: As pointed out above, parental authority over an illegitimate child belongs to the mother. Silva may have won with the Supreme Court’s upholding of his visitation rights, but this favorable decision did not prevent Suzanne in the exercise of her parental authority from immigrating to Holland with her two children. 2. No need to go to court if the mother and father can agree: If the mother and the father of the illegitimate child can agree amicably on the terms and conditions of the father’s visitation rights, then there will be no problem. In case of disagreement however, the father has to file a petition asking the court to settle the issue of visitation rights. 3. Can a father be denied visitation rights? The Supreme Court in its Silva ruling stated that Suzanne’s fears and apprehensions were unfounded as to the father’s corrupting influence over the children. If it is proven therefore that indeed the father is a negative influence on the children (because of reasons like immorality, drunkenness, etc), the trial court, taking into consideration the best interest of the children, can deny his petition for the exercise of his visitation rights. 4. Is the mother’s written consent always necessary before the father can take his illegitimate child out? Does the Silva vs. CA ruling of the Supreme Court mean that in all other cases the mother’s written permission must always be obtained before the father can take his illegitimate child out? As you can read from the excerpts of the SC decision above, the Quezon City RTC imposed this precautionary measure in view of Suzanne’s apprehensions over the negative influence of Silva’s alleged womanizing. The Supreme Court in the case of David v. Court of Appeals (G.R. No. 115821, 13 October 1999, 316 SCRA 710) held that the recognition of an illegitimate child by the father could be a ground for ordering the latter to give support to, but not custody of, the child. In other words , the right to visitation and the duty to pay child support are distinct and separate. 2. There are occasions when the mother marries a man who wishes to adopt her illegitimate child. Is the consent of the biological father necessary? Section 9 of RA 8552 (Domestic Adoption Act of 1998) states that the written consent of the natural parent is necessary. If the mother can prove that she exerted earnest and diligent efforts to locate the whereabouts of the biological father but without success, then the written consent is not necessary. Social workers of the DSWD or of the Family Courts, citing the best interest doctrine, have generally given favorable recommendations in their Child and Home Study Reports for the adoption of illegitimate children. 1. Carlitos Silva and Suzanne Gonzales had a live-in relationship and they had two children, namely, Ramon Carlos and Rica Natalia. Silva and Suzanne eventually separated. 2. Silva and Suzanne had an understanding that Silva would have the children in his company on weekends. 3. The legal conflict began when Silva claimed that Suzanne broke that understanding on visitation rights. Silva filed a petition for custodial rights over the children before the Regional Trial Court Branch 78 of Quezon City. The petition was opposed by Gonzales who claimed that Silva often engaged in "gambling and womanizing" which she feared could affect the moral and social values of the children. 4. The Quezon City RTC ruled in favor of Silva giving him visitorial rights to his children during Saturdays and/or Sundays. The court however explicitly stated that in no case should Silva take the children out without the written consent of Suzanne. 5. Suzanne filed an appeal from the RTC’s decision to the Court of Appeals. In the meantime, Suzanne had gotten married to a Dutch national. She eventually immigrated to Holland with her children Ramon Carlos and Rica Natalia. “With Articles 3 and 8 of PD 603, in mind, We find it to the best interest of the minor children, to deny visitorial and/or temporary custodial rights to the father, even at the expense of hurting said parent. After all, if indeed his love for the children is genuine and more divine than the love for himself, a little self-sacrifice and self-denial may bring more benefit to the children. While petitioner-appellee, as father, may not intentionally prejudice the children by improper influence, what the children may witness and hear while in their father's house may not be in keeping with the atmosphere of morality and rectitude where they should be brought up. “The children concerned are still in their early formative years of life. The molding of the character of the child starts at home. A home with only one parent is more normal than two separate houses - (one house where one parent lives and another house where the other parent with another woman/man lives). After all, under Article 176 of the Family Code, illegitimate children are supposed to use the surname of and shall be under the parental authority of their mother. The issue before us is not really a question of child custody; instead, the case merely concerns the visitation right of a parent over his children which the trial court has adjudged in favor of petitioner by holding that he shall have “visitorial rights to his children during Saturdays and/or Sundays, but in no case (could) he take out the children without the written consent of the mother x x x." The visitation right referred to is the right of access of a noncustodial parent to his or her child or children. There is, despite a dearth of specific legal provisions, enough recognition on the inherent and natural right of parents over their children. Article 150 of the Family Code expresses that "(f)amily relations include those x x x (2) (b)etween parents and children; x x x." Article 209, in relation to Article 220, of the Code states that it is the natural right and duty of parents and those exercising parental authority to, among other things, keep children in their company and to give them love and affection, advice and counsel, companionship and understanding. The Constitution itself speaks in terms of the "natural and primary rights” of parents in the rearing of the youth. There is nothing conclusive to indicate that these provisions are meant to solely address themselves to legitimate relationships. Indeed, although in varying degrees, the laws on support and successional rights, by way of examples, clearly go beyond the legitimate members of the family and so explicitly encompass illegitimate relationships as well. Then, too, and most importantly, in the declaration of nullity of marriages, a situation that presupposes a void or inexistent marriage, Article 49 of the Family Code provides for appropriate visitation rights to parents who are not given custody of their children. The Court appreciates the apprehensions of private respondent and their well-meant concern for the children; nevertheless, it seems unlikely that petitioner would have ulterior motives or undue designs more than a parent’s natural desire to be able to call on, even if it were only on brief visits, his own children. The trial court, in any case, has seen it fit to understandably provide this precautionary measure, i.e., "in no case (can petitioner) take out the children without the written consent of the mother." Hi i am a 22 year old single mother and i have a 2 year old daughter and she was born on April 7, 2006. I wanted to ask if i would be affected by the IRR since she has been visiting her father by the other grandparent's intuition, even though the father has not signed in the birth certificate or and public document. Would i have a problem with the IRR in the future? hi i am 33 years old now single mother for last 2 years ago of my 1 son. When i was 28 years old i was pregnant to this child and i wasn't able to get married to my son's biological father due to some problems because he had alive in partner and with kids to other woman ahead of me. Me and my family decided not to marry him. Then right now i was successfully married to a american guy and we have no child since we got married last 3 years now. My 5 years old son wasn't recognized yet or wasn't acknowledge yet to his biological father. My son's surname being used since birth was my family name single mother in the NSO. Right now me and my husband came up to this plan that we're going to used his surname to my 5 years old son. In his NSO birth certificate was unknown. I plan on this coming december vacation time i have to process at the LOcal registrar and to the NSO office to used and bring my husband's surname to my son's birth certificate. Can we do this? and we will not consult to the lawyer anymore to avoid expenses and we will not use the ADOPTION for husband to my son. He will be automacally the father to my son. Can we do this or not. Please help me and i really need ur advise before going on to this. Thank you and hear your reply. You can even send ur reply to my email: angging30@yahoo.com. Thank you. You will encounter several serious problems with your plan. 1. You and your American husband will be committing a crime under the Domestic Adoption Act of 1998 called “simulation of birth.” The penalty is eight years imprisonment and fifty thousand pesos fine. 2. As far as I know, the US embassy here is requiring immigrants to submit DNA test results. The DNA test results will show that your American husband is not your child’s biological father. Your petition for immigration will most probably be denied. As a matter of practice, I will not send my reply to the e-mail address you stated but simply post it here. If you had contacted me through this e-mail (angging30@yahoo.com), then I can answer you by e-mail. The reason for this practice is that I do not have any assurance that the e-mail you indicated is your own e-mail. I hope you will understand. My fiancée cannot locate the illegitimate father of her child born 4 years ago.He abandoned her when she was only 3 months pregnant .How does she get full custody of the child to travel to Australia on a Fiancée visa.No one knows of his where about. hi, i am 28 years old with 4 yrs, old illigetemate daughter, she used the surname of her biological father. We was abandon 2 yrs. ago. I have plan to bring her abroad with my fiancee. Do i need permission to her biological father? Based on the DSWD amended rules on travel clearance, the Parental Travel Permit, which was a former requirement for a minor traveling with only one parent, is no longer needed. A minor traveling abroad with either parent or with his her solo parent or legal guardian is exempt from the travel clearance requirement. Please browse the DSWD website for the amended rules on travel clearances for minors. Based on the amended rules, the Parental Travel Permit, which was a former requirement for a minor traveling with only one parent, is no longer needed. A minor traveling abroad with either parent or with his her solo parent or legal guardian is exempt from the travel clearance requirement. You should also obtain a solo parent ID by registering with the SWD of your town or city. I will assume that you and the mother are fighting over the custody of the child. Please take note that under Article 176, the mother has SOLE parental authority and the father only has visitation rights. Thus the mother can entrust the custody of the child to anyone she wants. If you want either temporary custody of the child while the mother is abroad or permanent custody, you have to file the proper petition in court. 1. Would it be possible that if we agree on something, its legal that I take my child with me for vacation with her consent? 2. Isnt she violating any legal law since the child should be with her and should not be with someone else? If so, can I file for custody of the child? 3. What are the details of the visitation rights? Is it just visiting the child? Can I take out my son with me and sleep with me for the weekends/for a week? 1. Please take note that since the child is illegitimate, the mother has SOLE [parental authority. What you have are visitation rights only. If you want custody, then you have to go to court and file a a petition to deprive the woman of custody. Thus, please take note that you cannot insist that she cannot go and live in the province because that would interfere with your visitation rights. Her going to the province with the child is an exercise of her parental authority. In that exercise of parental authority, she may leave the child to another person’s care. However, if the child’s welfare is affected, then you can file for custody of the child. Considering however the bias of the law in favor of the mother (especially when we talking about illegitimate children), you will have great difficulty in getting a favorable court decision. As discussed in one Supreme Court decision, although the man was granted visitation rights, his rights did not and could not prevent the mother from taking her children abroad when she immigrated. The problem however with just agreeing with your common law wife is that such agreement can be easily set aside whenever you have a fight or disagreement. It is much better for you to go to court asking it to set your visitation time and conditions. Do you have a copy of the first birth certificate? Does it contain the ex boyfriend’s surname as that of the child? Please read my post “What surname should illegitimate children use? Problems and issues with RA 9255 and its implementing guidelines” (look for the link in the sidebar). Your fiancée should file a petition under Rule 108 for the cancellation or correction of the first birth certificate. 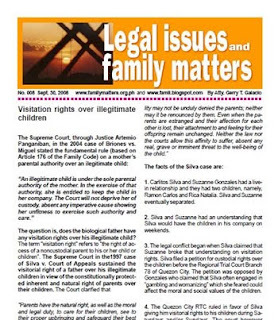 Please surf to the Legal Procedures section of my website www.familymatters.org.ph for a copy of Rule 108. Im wency,I have 3 children to my ex girlfriend one girl age 12 and twin boys age 9, her family got us separated since we are not married because im jobless, the twins are 2yrs old then. since then my ex did not allow me to visit my children until now and the sad part of it she got married and she told my children that their father is her new husband. my children did not recognize me as their father. The twins has my surname. What are my rights to my children since they dont know me,do i have a visitation rights, since i cannot support them but my sisters and my father can support them do i still have the right to be acknowledge by my children as their father? thank you hope you can help. The issue of visitation rights and support are separate. As you have already read in this post, you have visitation rights and for your children to know you as their biological father. If you and your children’s mother cannot agree, then you will have to go to court to let it decide on the terms and conditions of your visitation rights. I'm Maricor, 31y/o, I have a daughter she's already 11 years old. Sad to say but she's my illegitimate child. The birth certificate of my daughter has no fathers name in it and she carries my maiden name...now I'm already married. me and my husband are planning to change my daughters surname to my husbands surname. I would just want to ask for some advice on how would be the process for changing surname. thank you very much. The proper legal remedy is adoption. Please read my post “Procedures in adoption under RA 8552” (look for the link in the sidebar). Do NOT simply get a new birth certificate for the child placing your names as mother and father. This is “simulation of birth” and is a crime punishable with eight years imprisonment under RA 8552.
i'm european, married recently and my wife have a illegitimate child and the father doesn't support the child and doesn't give the consent to come to europe. The solo parent ID can be give to her? I don't know that the fact that we are married in europe but not registered in Philippines yet can be a problem to issue of the ID. My country required a paper proofing that she is a solo parent, did i need to go to NSO with that ID. Please read my post “A primer on RA 8972 or the Solo Parents’ Welfare Act of 2000” (look for the link in the sidebar). The DSWD provides for rules and documentary requirements for the issuance of the solo parent ID. Your wife has to inquire with the DSWD in her town or city as to these requirements. Please surf to the DSWD website (www.dswd.gov.ph) for the relaxed amended rules on travel clearances for minors. i have a child. the father did not acknowledge the child in the birth certificate. After 5 years, he wants visitation rights with his child. Does he need to establish first that he is the father? Can he be granted visitation rights even if he did not recognize the child in the birth certificate? If you want to contest the man’s visitation right because he is not the child’s father, then you can ask him to submit to a DNA test at his expense. But if you know that he is really the father, you will just be wasting his time and resources (for which he can ask you for reimbursement). In the latter situation, you can protect your child by asking the man to issue a notarized document admitting his paternity of your child. Reason: so that your child will have the right to inherit from the father under Article 176 of the Family Code. Please take note however that if the father acknowledges his paternity (by signing the birth certificate, or issuing an AUSF or a private handwritten document), he can have the birth certificate annotated and your child will be forced to use his surname, even against your consent. Please read my post “What surname should illegitimate children use? Problems and issues with RA 9255 and its implementing guidelines” (look for the link in the sidebar). Good day attorney. I was married to a man with 2 not “so sure” as his children. Why “not so sure” because my husband is not really sure if the kids are really his due to his ex girlfriends background on men. But if you’re going to based it on the children appearance then his ex girlfriends insisted that it has my husband’s family blood but still his parents are in doubt as well. My husband and the girl were not married since their parents are not in favor for both. So both kids had their mother’s surname. Then came another girl in the scene that really made my husband and the mother of the kids fought and broke up. During that time, my husband got the chance to work and earn only basic salary and since the mother of the kids was disappointed due to new girl involved, she asked my husband to go to their barangay and signed an agreement that ¼ of my husbands salary during his contract on that company will be given to her for the kids. 2 months salary where only given to her and my husband decided to end his contract and didn’t work for almost 2 ½ years. After 3 years, my husband got the chance to work on board a ship where we actually met and decided to get married in the Philippines. I was informed by him and his parents that he has 2 “not so sure” kids which I accepted. I was also informed that financial supports where not given since after the baragay thing. Since we already get married, but have no child yet, my husband really decided not to give any financial support to the kids. One of the reason is, the mother of the kids where involved in gambling and had too many men… (the mother of the kids is soon to be married also). Now the mother of the kids is asking for financial support since she knew that my husband got a nice work with somehow nice income. 1. Even though my husband did not acknowledge or sign anything that would say that he is the father of the kids, does the mother of the kids have the right to demand on the financial support or any support needed? 2. Is it really ¼ of my husband’s salary? Or it depends on my husbands will how much would that be? 3. If the girl will be married (since it will be soon), can her husband adopt the kids and shoulders all the financial support needed by the said kid? 4. Does the mother of the kids had the right to file a case against me since she insisted that I was the one who force my husband not to give any support to them? 5. What are the other legal rights of those kids being illegitimate? Hi Atty. Gerry I Just need to seek for your advice I am getting married soon to my fiance' who has a 7 yr-child from his past girlfriend. Will you please be kind to advice me concerning the legalities and rights of the illegitimate child that I need to know beforehand so I can protect my future kids'when it comes to rights, properties and legalities.I will surely appreciate if u could advice me everything that I have to do and know given the situation. Many thanks! 1. Can I sue the guy? What could be a valid case? 2. Can my husband and I adopt my daughter's child at birth? Do I need the guy's consent if I do that? The Family Code prohibits marriage for anyone below 18 years of age even with parental consent. Besides, your daughter is too young and too immature to get married even when she reaches 18. As to filing a case against the guy, please read my RA 9262 “Anti-Violence Against Women and Their Children Act of 2004” posts (look for the links in the sidebar). The law applies to girlfriend/boyfriend as in the case of your daughter and the guy who got her pregnant. There are also applicable provisions under the Revised Penal Code. The problem is if your daughter will not cooperate in filing the case or refuses to testify against the man. One option that you have is to file an administrative case against the man if he is a government employee. If he is a private employee, you can talk to the HR department of his company and ask about the possibility of filing whatever cases you can file against him in view of the company’s rules and regulations. As to adopting your daughter’s child, please read my post “Procedures in RA 8552 domestic adoption and RA 8043 inter-country adoption; misinterpretation of RA 9523 (look for the link in the sidebar). Do NOT simply file for a birth certificate to make it appear that your daughter’s child is your own child; this is not adoption but “simulation of birth” which is punishable by eight years imprisonment under RA 8552. As to the consent of the biological father, I discussed that issue in my post on adoption. I've previously written you about my cousin, who has an illegitimate child with a college instructor, and was living in with her current boyfriend in his parents' home. The social services kept calling on behalf of the father, and she felt harassed and feared they could take her child. She sought the PAO's help in QC, but it appears that the father had already acquired their assistance in the province, requesting custody. So she's returned to Leyte with her child and has agreed with social services there, among others, to allow the father to take the child during weekends, and she said she gave her signature. Now, she wants to come live with her boyfriend again in manila and get married, but she can't because she fears that she can't take the child with her and that they could take custody if she does. Does the social services really have the authority to do this? What can they do? Thank you and may you always be blessed for the help you're giving with this blog. My husband and I got married 4 yrs later after our first child was born. Her birth certificate was in the name of my husband since she was properly acknowledged. I just noticed her birth certificate has a date of marriage of us, her parents, when we have left it blank because we are not yet married when she was born. How do I have this corrected? Meantime, can she still use the birth certificate with the erronious date? She needs it for entrance exam applications. Thank you and more power to you. You're a big help to people like me. This is related to the previous post about my cousin in Leyte. I should add that she says the 'kasulatan' she was persuaded to sign also forces her to leave the child to the father if she leaves town. Having sole parental authority, is she legally bound to honor this? I feel she was duped into agreeing to this, because of her ignorance and fear of the social services. The child is illegitimate and so under Article 176 of the Family Code, sole parental authority belongs to the mother. The social services you refer to (which I take to mean the SWD in the town or city) cannot dictate to the mother what to do with the child. If the mother wants to transfer her residence to another place, she is free to do so without fear that she will lose custody of her child. It is only our Family Courts which can deprive your cousin of custody or terminate her parental authority. Please take note that in the Silva case which I discussed in this post, the father was granted visitation right by the court. But despite this visitation right, this did not prevent the mother in the exercise of her parental authority in immigrating to another country with the children. Your cousin can repudiate that agreement she signed with the SWD if she was coerced (forced) to sign it or if she was not fully informed about she was agreeing to. Your cousin can ask for help from the following government offices or agencies. The addresses are for Metro Manila but you can try to contact their regional offices (specially the NBI). 1. Have you inquired with the Local Civil Registrar of the town or city which issued the birth certificate as to how the problem arose? Please clarify also: Did you and your husband apply for LEGITIMATION of your child? 2. This error is in the nature of a substantial in nature and a petition under Rule 108 should be filed to correct the birth certificate. 3. You can probably talk to the Office of Admissions (or Office of Student Affairs) of the school where your child will take the entrance exams and explain to them the situation regarding the birth certificate. You can probably submit an affidavit explaining the discrepancy and explain that you are pursuing legal remedies. Is the consent of the legitimate children of an American who intend to co-adopt with a Filipino wife needed or required? Without any exception? Please read my post on adoption (look for the link in the sidebar). Section 9 of RA 8552 requires the consent of the “legitimate and adopted sons/daughters, ten (10) years of age or over, of the adopter(s) and adoptee, if any”. Legitimation is provided under Articles 177 to 182 of the Family Code. An illegitimate child becomes legitimated if the biological parents get validly married after the child is born. If Articles 177 and 178 are complied with (there were no legal impediments on the part of the biological parents when your child was conceived), then you can apply with the Local Civil Registrar of the birth place. After submission of the required documents, the LCR will annotate the fact of legitimation on the original birth certificate (it will not issue a new birth certificate). As you can see, since there will be no new birth certificate, the problem of the date of marriage in your child’s birth certificate will still be there. In fact, the LCR might question why you are applying for legitimation when the birth certificate states that you are already married when the child was born. Rule 108 is really the more appropriate remedy. Please inquire from other lawyers who might have opinions different from mine or who might be able to suggest other alternatives. Thank you for clearing things up for me. I shall advise my cousin that she can freely move here in manila. I'm still worried though. In Atty. Florido's blog, which you referred to here somewhere, she talks about parenting agreements. And she writes that 'it applies to co-parents, whether they were formally married to one another or not,' and 'violations of the agreement can can give rise to a legal action for breach of contract or to a motion for contempt against the breaching party.' And then there is the 'moveaways or relocation provision.' I know you've already explained Article 176, but she won't be able to handle it if the father were to charge her. She doesn't have anyone to help her, and it's impossible for me because of busy schedule, distance and the fact is I'm having problems of my own. All I can do is message her what I learn here. In law, we have what are called “vices of consent”. These are things that give rise to “vitiated consent” like force, threat, intimidation, pressure, bad faith, etc. Even if a person has entered into a contract or agreement, this can be set aside if there were vices of consent. In your cousin’s case, it seems that she was pressured and intimidated into making that agreement. The agreement can therefore be set aside. I already gave you the contact information of government offices and agencies (DSWD, PNP, NBI) from which your cousin can for help. It's me again, and the troubles of my poor cousin. I hope you can still be patient with me, I'm kind of a slow learner. The DSWD has never been any help to her, they seem to be biased to the father since she herself is poor. He is unwilling to pay for support, so they seem to be pressuring her to just give the child to him. Given the innate apathy and corruption in their province, I can understand her helplessness. I don't think anyone would at least take her seriously until she actually gets physically harmed. Is there anything she can do to preempt all the trouble that could be caused by this agreement? Can she go to the SWD, state that she takes it back and be done with it? She has to leave in a few days to hitch a ride with a relative who will go by car, and she's afraid she'll lose her chance if the father delays her or refuse to give the child back. I can't thank you enough Atty. Gerry, you are truly a godsend. Like I said, your cousin should seek the help of the government offices I mentioned before (PNP, NBI, DOJ, etc). hello! i am 24 years old and a single mother to a 2-year old daugther. She is an illegitimate child because the father of the child and I were never married. She is using the father's surname and she was recognized by the father in the birth certificate. We are already separated and not living together. I am enrolled in the Competence Assesment Service of Queensland Nursing Council. I took the written exam here in Manila and will be taking the competency part B (Related experience) in Australia. I'm planning to apply for a short stay visa 456 which will allow me to go to Australia and stay there for the duty (3 Months). I have plenty of relatives already living in Australia and since I'm a single parent, i want to take my child with me. I read and learned that for me to be able to do that is to let the father (non-accompanying parent) to sign the FORM 1229 to grant my minor child an Australian visa and to provide consent letter also signed by the father stating the he has no objection of our child traveling and living in Australia. The problem is that the father doesn't want to sign the form. He is holding us back. like i said, we are already separated. He never provided any financial support to the child since my daughter was born. For me, i was able to work before and I am the one whose basically earning money to provide the basic necessities to my kid. The father is avoiding my calls and is not replying to any of my text messages. We cannot reach him even in their own home. What other option can i take? I don't want to leave my daughter here in the Philippines because I want to give her the best future possible and being a nurse in Australia will allow me to provide everything to her. I've been trying to contact the father and he keeps on making up stories / alibis to not provide a copy of his passport or national identity card and signature which are requirements for my child to have an Australian visa. It is written in the Form 1229 that if I am the solely responsible for making decisions about where the child is to live then i can sign the form myself. I was just wondering how I can be declared as solely responsible and have sole parenthood over my illegitimate child? Do i have to get the DSWD clearance and would that be enough? what other documents should i provide? I have an affidavit done by our lawyer about the issue declaring me to be the solely responsible for the decision making and it was notarized as well in front of the lawyer. Will that be enough or do i have to get any documents such as declaration of abandonment? And i heard about the solo parent id. i'm planning to get that this week also the certification from the DSWD office. i already have the cert of no marriage from NSO. so will that be valid so that i can travel with my daughter? as long as i get the solo parent id and the certification plus the cert of no marriage? i already created an affidavit stating the reasons why i wanted to have full responsibility over my child. should i include that as well in my application? My husband has 2 children from his live-in partner before. We're having problems with the woman, because she wouldn't want my husband to see his children. My husband is a seaman. We got married last month. She keeps on sending unethical messages to me, my husband and my mother-in-law. At first, before having his 1st child, she started to threaten my husband that she will commit suicide. Up to now, December last year, we have her messages. She's unemployed. She teaches his 1st child (whose 8y/o, his 2nd child is 3y/o) bad words, to call his papa by his name only, i also have a text message using his child's name saying things you could not imagine an 8-yr old boy could say. She's demanding a big amount of money. There are times when she will ask for money saying that the children were sick, but most of the time they're not. My husband is a good person, I can feel the pain whenever he remembers his children. 1. Which is much better to file for petition? custody or rights for visitation only? 2. Is it possible for my husband to file the petition even he goes in and out of the country because of his work? 3. Approximately how long will it take to finish the case? 4. If he'll file for custody, is there a possibility that he'll win the case, and have his 2 children? Considering the actions of the woman? *I'm also a seafarer, if ever he'll have the custody of the children ,to whom he may entrust them? My parents-in-law has a petition in US and maybe this year they will leave. But my husband has 2 brothers working here and a Baranggay Captain aunt- whose willing to take care of the children whenever we're out of the country. Thank you Attorney Galacio, you're helping a lot of people. hope to hear from you soon. As to custody, it will be very difficult for your husband to win such a case against the woman (considering that the children are illegitimate). Please read my posts on custody battles over children (look for the links in the sidebar) and the Supreme Court ruling in Tonog vs. CA, G.R. No. 122906, February 7, 2002. Since your husband (and you) will be out of the country because of your respective jobs, the court will take this fact against your husband. Please read the Supreme Court ruling in Vancil vs. Belmes, G.R. No. 132223. June 19, 2001. Filing a petition for visitation rights is a much better option. Please take note however the visitation right is personal to your husband. You or your husband's family cannot exercise this right for him. Meaning, if your husband is working abroad, you or his family cannot insist on having the kids visit you. Your husband can act proactively by filing a petition to set the terms and conditions of his visitation right together with a request for the court to set the amount of financial support he will be required to give. Our courts are not only courts of law but also of equity. Your husband can request the court to order the DSWD of your town or city to visit the children and look into their welfare from time to time. Your husband's lawyer can ask the court to set the hearings when he is here in the Philippines (the lawyer can also resort to what is called modes of discovery) to expedite the hearings. At the least, the hearings could take over a year since Family Courts are overloaded with cases. I have a 2 year old daughter with a married man. Her father acknowledged her by signing her birth certificate but did not allow her to use his last name (she uses my maiden name). Her father and I have separated since and he made it clear that he didn't want anything to do anymore with our daughter or me. My question is if there is a document/affidavit that I can have him sign that will make him relinquish his parental rights and make me as the sole decision maker as regards my daughter's welfare. I want to sever our ties already with him and I was thinking that a document like that will avoid me the hassle to going to him for his signature and consent, etc. Your daughter is illegitimate, even if she was acknowledged by her biological father. Your daughter remains illegitimate even if, for example, she is using her father’s surname in the birth certificate. Under Article 176 of the Family Code, you have SOLE parental authority over her. This means that custody and all decisions over your daughter belong to you alone by express provision of the law. What the biological father has is visitation right. If you and the father cannot agree on the terms and conditions of the visitation, then either he or you should file a petition in court to set these terms and conditions.